Things have settled down again here now, and I have had a little time and energy to attend to this blog ... which also means I have a little more information about the module. I have decided that some of my in-game interfaces may need more information for the player when encountered for the first time. Therefore, to this end, I decided to put together a single "Help and Information" script that is called from clicking on a button that these interfaces may have. Hovering over buttons brings basic information. 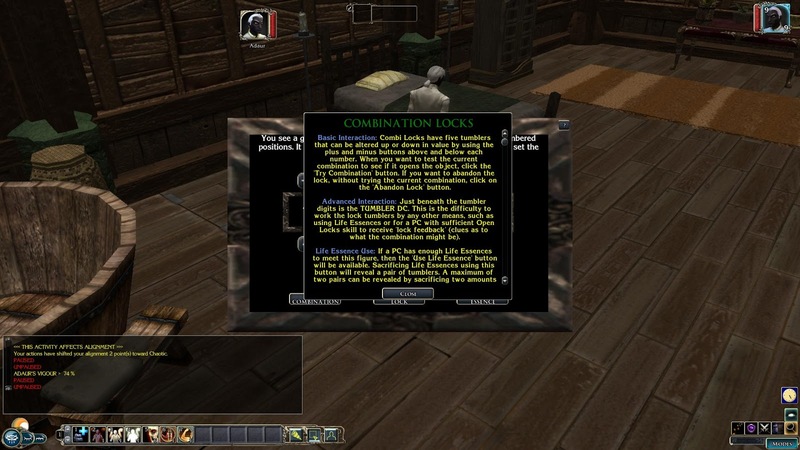 The player requires some extra information about potential interaction and so clicks the option. The player can scroll to read all the extra information available. From my own experience, I have found that some games do not give enough "instructions" for my liking and having a quick discrete button to additional information and help seemed to be the best solution as far as I could see.